(L-R): Brand Specialist, Globacom, Sarat Danjuma, Regional Manager, Lagos Island and Ogun, Globacom, Olufolahan Faseyitan, one of the five runners-up in Gloin60seconds contest, Shaka Aaleeyah Ehireme, Head of Digital Marketing, Globacom, Ahmed Ishtiaq and Oluwakemi Akinyele of Customer Care, Globacom when the company presented prizes to grand finale winners of Gloin60seconds contest in Lagos on Tuesday. For John Sunday Peter, one of the grand finale winners of the online talent hunt, GLOIN60ECONDS organised by the grandmasters of data, Globacom, the cash prize of N200, 000 is a welcome solution to his accommodation problems as he intends to pay for his desired apartment in Lekki area of Lagos State. 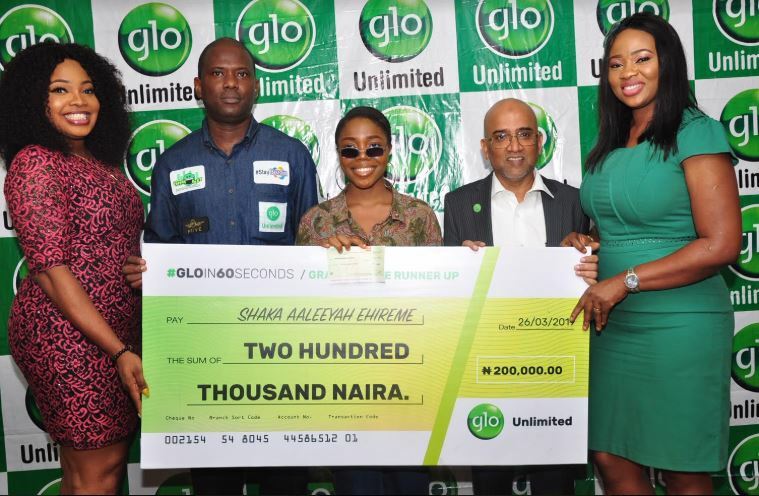 The excitement was palpable on Tuesday March 26th, 2019 at the Mike Adenuga Towers’ headquarters of national telecommunications company, Globacom, as the six grand finale winners of its online talent hunt competition, received their prizes. In addition to him, five others, who won the consolation prize of N200, 000 each, included Nwogwugwu Brainie, a Law graduate of Nnamdi Azikwe University, Awka, who currently manages ‘Jimmy’s Play House’, a dance, photo and music studio in Owerri, Imo State and Doyin Hafeezah Salau, a 400-Level female Law student of the University of Lagos who hails from Kwara State. Others are 23-year-old Biochemistry graduate of Michael Okpara University of Agriculture Umudike, Abia State, Emeh Emmanuel Okwun; 17-year-old Ehimare Aaleeyah Shaka, an aspiring music star from Edo State and John Sunday Peter, a graduate of Apa College of Education, Benue State. The lucky winners thronged the venue of the presentation ceremony with their friends and relatives as early as 9am, bursting with vivacious enthusiasm, to claim their prize monies. Receiving his N1million star prize, Ejembi, in an emotion-laden voice, thanked Globacom for providing the platform for him to win one million naira with his musical skit titled “Grandmaster”. He said “I am grateful to God, my friends and family. I will go on tour to promote talents in my area and also take relief materials to an orphanage. I will pay tithe and use part of the money to promote my radio and television shows. I am very grateful to God and to Glo”. Also commenting, Doyin Hafeezah Salau who won N200, 000 consolation prize said, “I have saved the N50, 000 which I won during the weekly shows and will add it to this N200,000 to buy video recording camera for my skit productions. Glo has really helped me and I am very happy that my career is taking shape”. This was just as ecstatic Ehimare Aaleeyah, who was accompanied by her parents enthused: “I feel blessed to be so recognised. I will use the money to pay my siblings’ tuition fees”. Another winner, 27 year-old Nwogwugwu Brainie said, “I am very happy, very excited. I feel indebted to Glo. I am a lawyer and a politician. I am the Imo State Chairman, National Interest Party. I will use my money to organise a talent hunt progrramme for youths in my community”. In his opening remarks, Globacom’s Regional Manager, Lagos and Ogun, Mr. Olufolahan Faseyitan, said that the, GLOIN60SECONDS competition was one of the company’s numerous customer appreciation offers conceived to engage and showcase budding talents as well as reward young creative people in Nigeria’s social media space. He assured that Globacom would continue to introduce more value-adding and life-enhancing products and services designed to enrich the lifestyle of its subscribers and their experience on the network. Under the challenge which was held for eight weeks, subscribers followed Glo on any of the company’s social media pages: @Globacomlimited on Instagram, @Gloworld on Twitter and Gloworld on Facebook, registered online and uploaded their videos. In the build–up to the grand finale, Globacom had presented cash prizes of N50, 000 each to 52 other lucky winners, right from week one to week eight in different cities across the country.